How on earth did a festival for a martyred saint, become inextricably associated with gifts of chocolate and expressions of romantic love? Ah, history. Readers have uncritically assumed that Chaucer was referring to February 14 as Valentine’s Day; however, mid-February is an unlikely time for birds to be mating in England. Henry Ansgar Kelly has pointed outthat in the liturgical calendar, May 2 is the saints’ day for Valentine of Genoa. This St. Valentine was an early bishop of Genoa who died around AD 307. By the 1800s, the Cadbury Brothers set up shop in England and began packaging candies to sell to a mainstream audience. 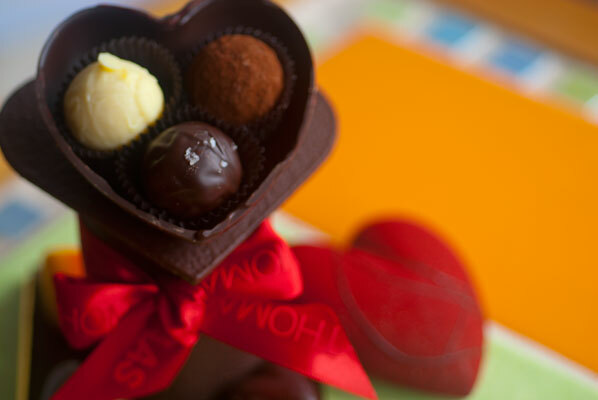 In 1861, in a genius marketing move, Richard Cadbury created the first ever heart-shaped box for Valentine’s Day, spurring the commercialization of the holiday. 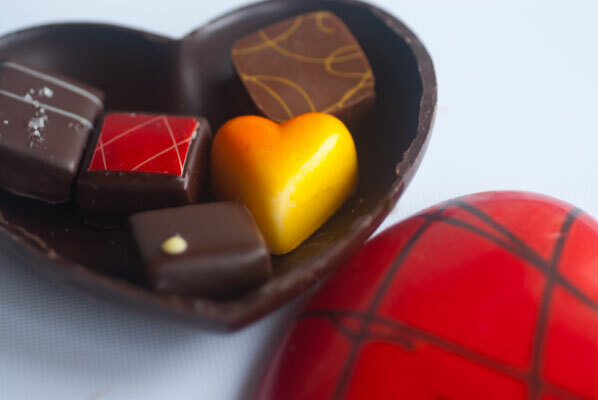 I have never been a fan of the heart-shaped box, especially if its velvet texture is meant to divert one’s attention away from the main event – the actual chocolate. Thank heaven for new ideas. 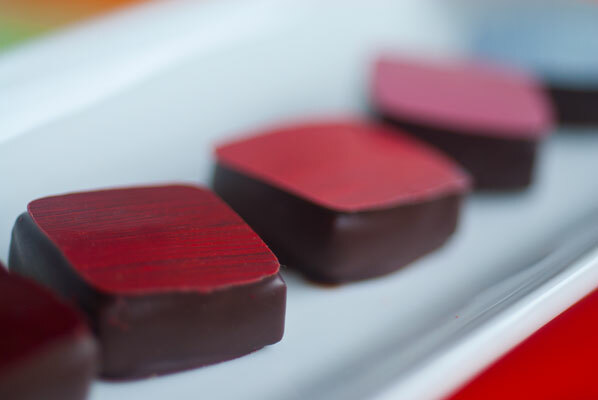 This week, my intrepid partner and I have had great fun discovering the extent and creativity of Valentine’s Day themed chocolates, produced by three of Vancouver’s most innovative chocolatiers: Cocoa Nymph, Thomas Haas and Beta5 Chocolates. 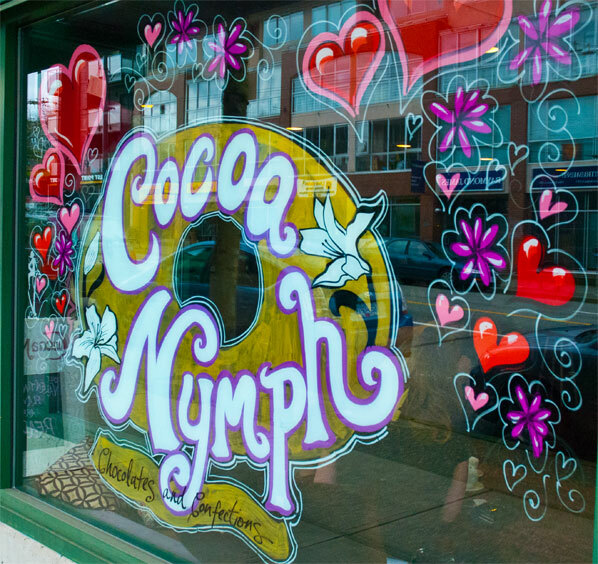 I had the honour of spending a day, this week, with Rachel Sawatzky and her lovely staff at Cocoa Nymph, actually getting my hands in the chocolate, enrobing and molding, and next week’s blog will tell that tale. I do not know if it is a reflection of our personalities, but Mischief is by far my favorite of these, while my partner loved the Desire! We head from here to Thomas Haas Chocolates and Patisserie, whose North Vancouver store is already full beyond capacity, with brave souls sitting outside on this mild, damp Saturday morning, and lining up the full length of the counter, to order pastries and chocolates. 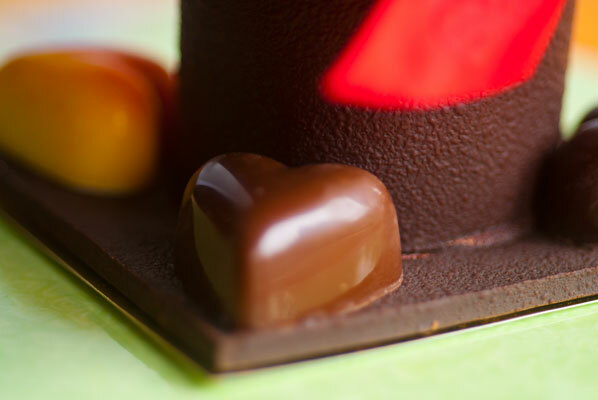 They have extended their hours this weekend to accommodate the many orders for Valentine’s Day, and we are fortunate enough to squeeze to the front of the line with two gorgeous examples of Thomas Haas’ artistry, not only delicious, but beautiful to look at – truly pieces of chocolate art. 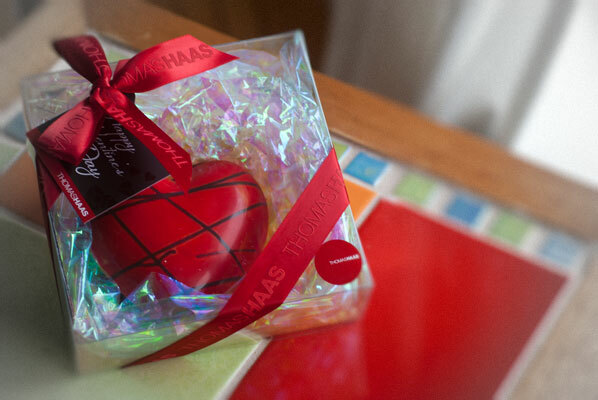 Their take on the ubiquitous red heart-shaped box makes me laugh out loud in appreciation. 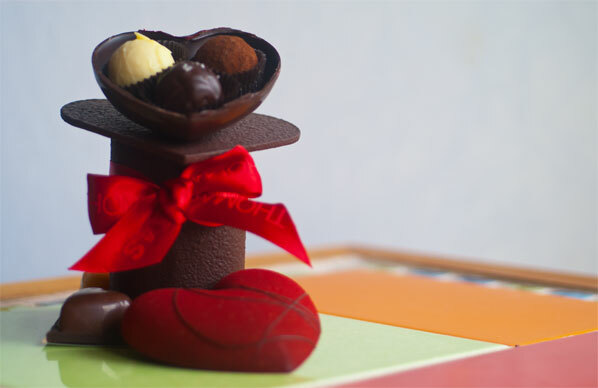 Behold, the dark chocolate heart covered in deep red textured cocoa butter, shot through with gold lustre dust, finished with thin dark chocolate threads. It looks like velvet. 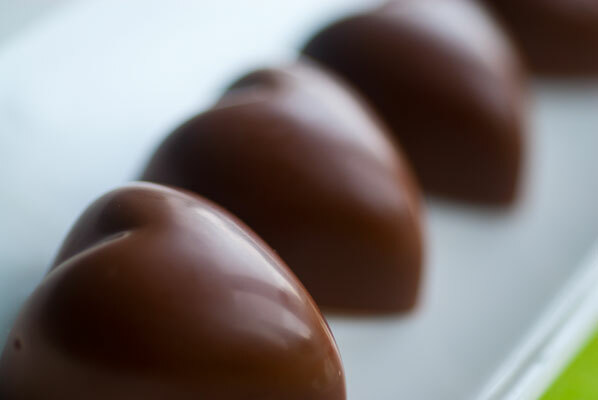 Inside this hollow heart are some of their finest truffles. 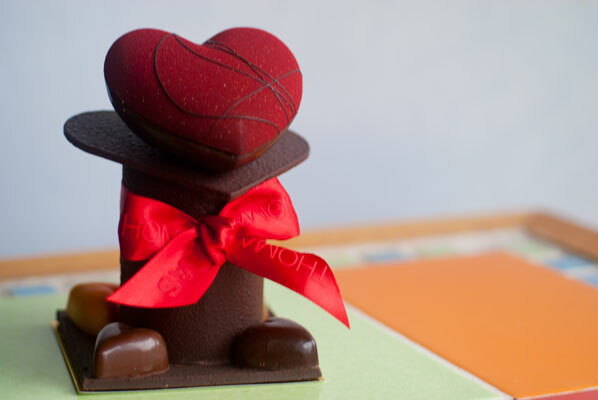 This sits atop a formed textured chocolate pillar, sitting on a textured chocolate base, with four more of their signature truffles, formed in heart shaped molds, and in the case of the white chocolate passion fruit heart, brushed with a soupcon of orange tint. 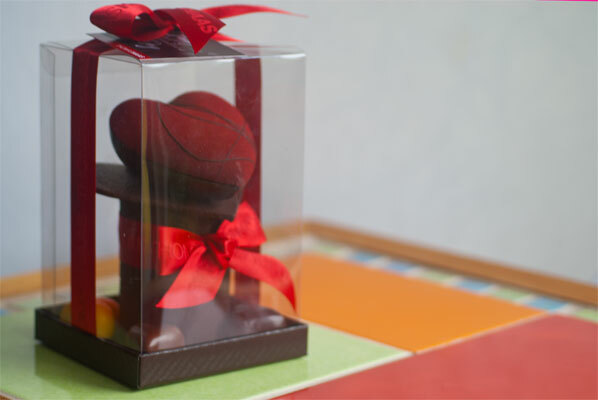 We also picked up this brilliant red hand painted heart, hinged together with a dab of chocolate, and filled with 5 of their best. 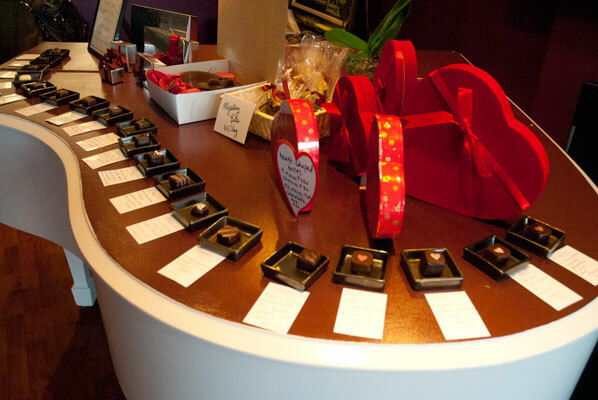 I just love going into this shop, and the chocolates are truly as delicious as they are beautiful to look at. A good thing, too, as it stops me from wolfing them all down in one sitting. These are creations to be savoured, and appreciated. 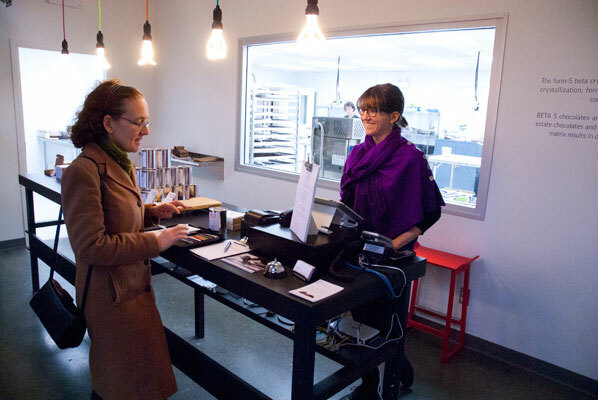 Our last stop is in East Vancouver’s industrial area, actually on Industrial Drive, to visit a chocolatier completely new to me. 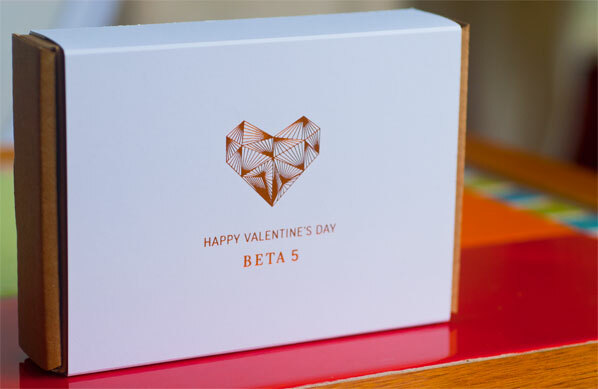 Beta 5 opened their doors in October of 2011, so they really are the new kids on the block, but they are off to a wonderfully innovative start. 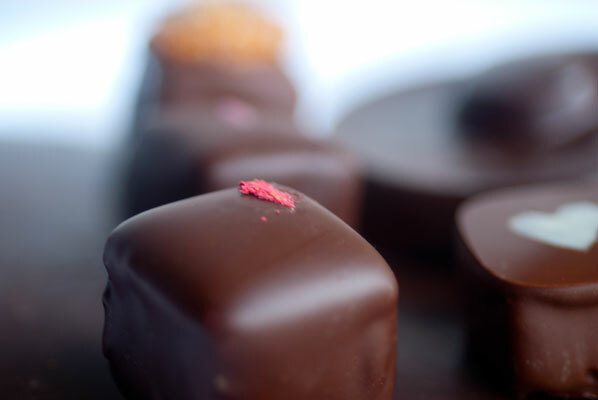 As their website says, they take their name from the stable crystals formed as chocolate cools, when it is properly tempered. I love their name – it is the Science geek in me, no doubt. 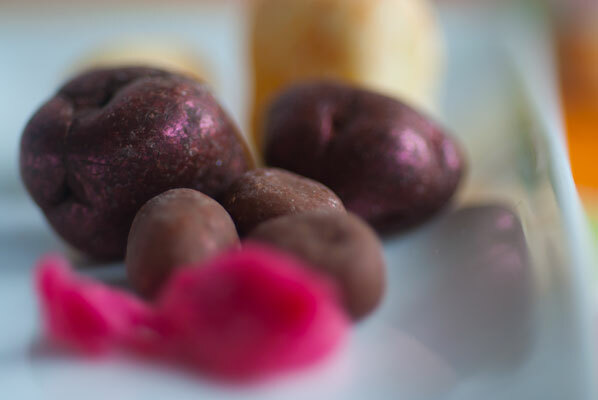 They make their chocolates in small batches, using ethically sourced estate chocolates, and premium ingredients. 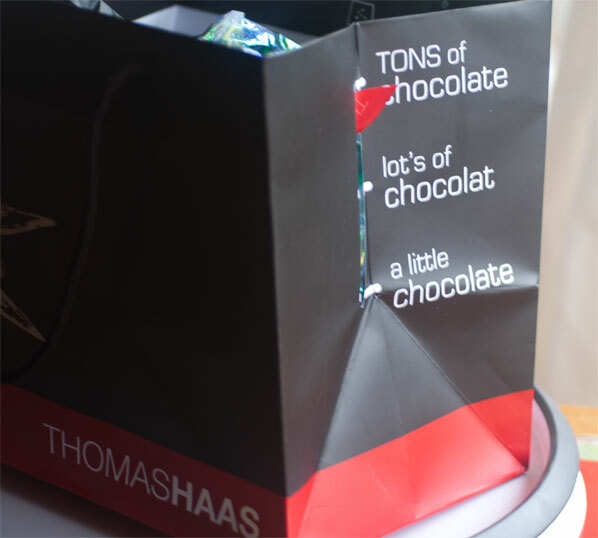 Their packaging is also really innovative, especially for a chocolate company. You will not find the hint of a velvet box, here. They use corrugated cardboard, bubble wrap and mini paint cans, and the effect is super-hip. It is no surprise that my techno-savvy partner was the first one of us to spot Adam Chandler and Jessica Rosinski’s clean and attractive website. 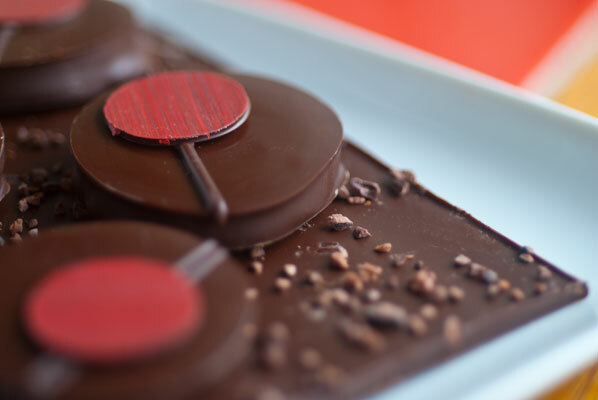 We are immediately drawn to the Rogue Valentine – a disc of 45% milk chocolate and Rogue Brewing’s ‘Shakespeare Oatmeal Stout’, enrobed in dark chocolate, and topped with a contrasting hand-painted chocolate disc. 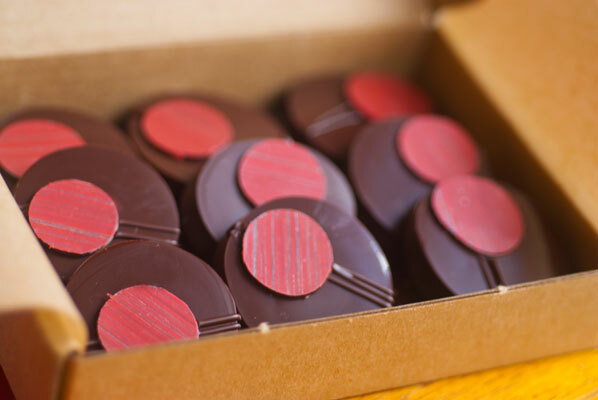 I love its muted tones, and the texture of the ganache is heavenly, soft and rich, with a nice snappy shell. 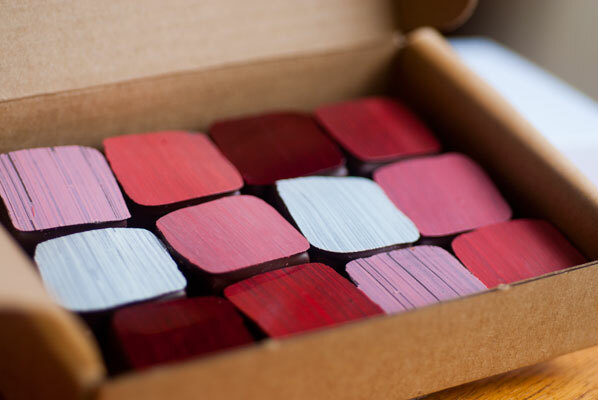 We also pick up a box of twelve (six different flavours) palette-shaped ganache truffles, hand painted in tones, from white through ochre to deep winey red, corresponding with the flavours of cognac, ginger, tobacco, cinnamon, port and 85% dark. 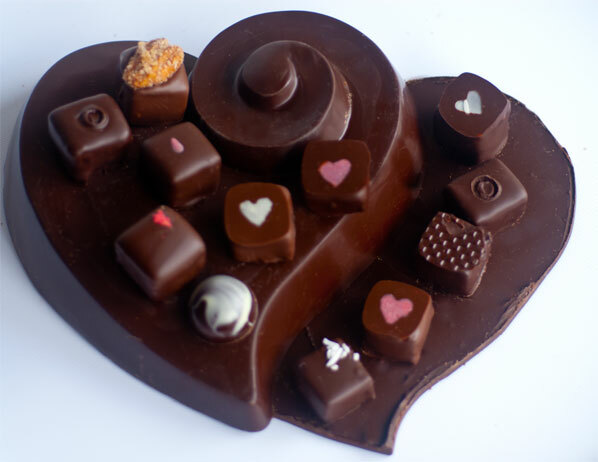 The visual effect is of an attractive palette of mosaic tiles, and the taste has that lovely soft ganache, with good snap to the shell. My particular favorite (aside from the Rogue) is the cognac, while my partner preferred the port. 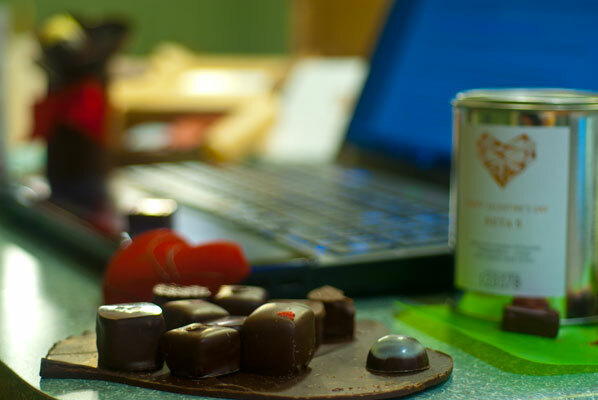 Rounding out the very different Valentine’s Day offerings from Beta 5, we pick up a can of chocolate covered pistachios, strawberries and citron with candied rose petals, and I cannot help myself – I pick out the citron – my absolute favorite (kinda like the cashews in the mixed nuts!). 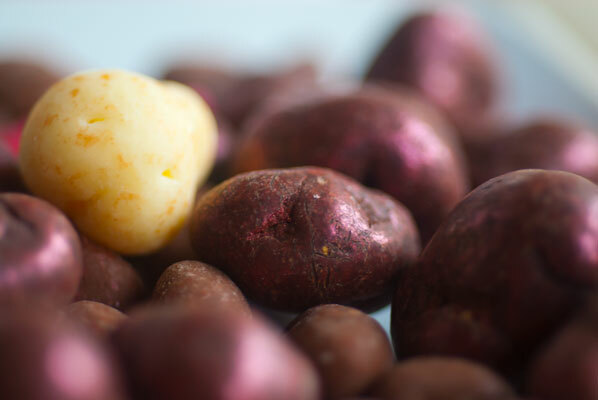 The whole tumble of colours in the mixture is so pretty, like pebbles from a rock tumbler. 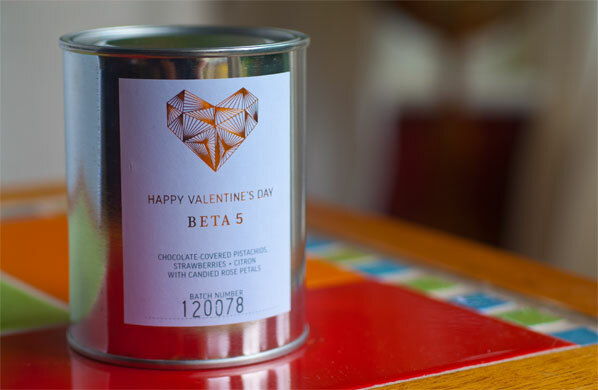 A really neat idea, and so different – I would love to receive this for Valentine’s Day, and I think it is the perfect antidote to hearts! 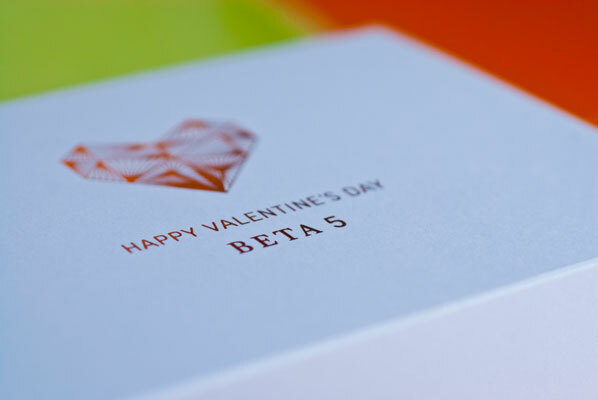 We will definitely return to Beta 5, as I am intrigued to find out more about their company and products. 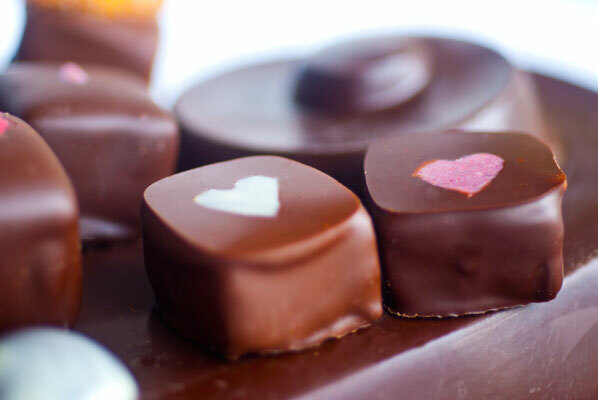 I love finding new, local businesses to support – especially chocolate ones! As my beloved partner and I arrive home, and begin to sample and taste, it becomes clear that this is a job not for two people, but one which needs to be shared. 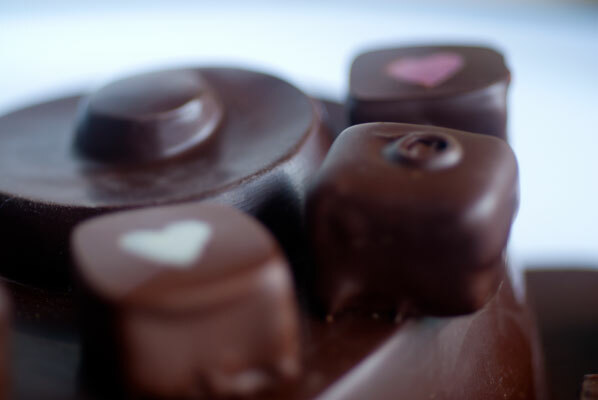 I take some chocolates over to our dear neighbour, our sons come in to try some, and I will take some more in to my students and colleagues, tomorrow. 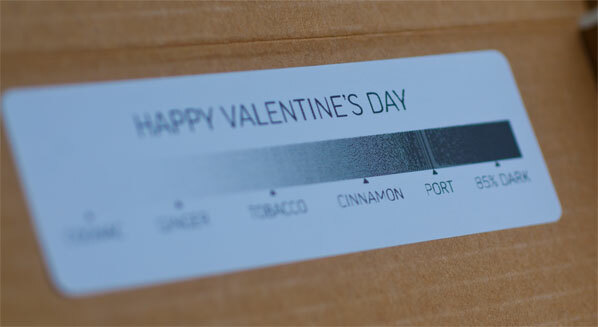 And perhaps that is the very best thing about these wonderfully original treats, and Valentine’s Day, itself. 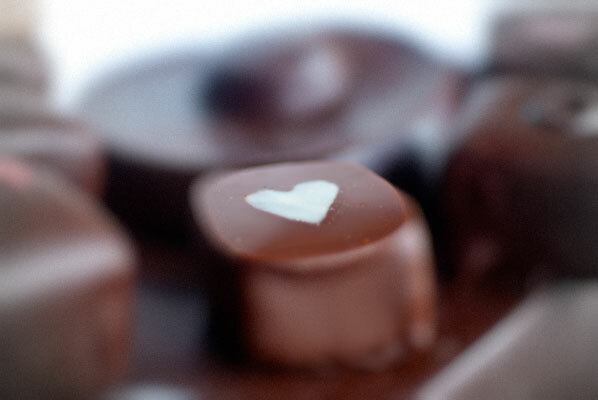 They are best enjoyed when shared – just like love. 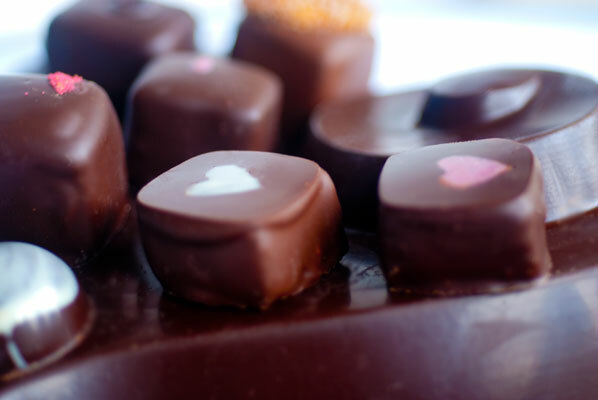 Finding these and other fine chocolate shops is easy – use ChocoMap.com from your computer, or download the free iPhone or Android Find Chocolate App!